We left Arkansas, but not the Ozarks, as we traveled into southern Missouri, state #18 on this 48-state adventure. Known as the “Show Me State,” Missouri is known for its grassy plains to the north and the forests of the Ozarks to the south. We have been amazed to see cattle ranches throughout our travels and learned while Texas and Oklahoma raise more beef cattle in total volume, Missouri is the top beef producer per acre. Missouri is also home to the 33rd national park we have visited… Gateway Arch National Park in St. Louis, which we’ll get to later in the post. Finally, Missouri is also known as the “Cave State,” because there are more than 7,300 caves and caverns across the state. 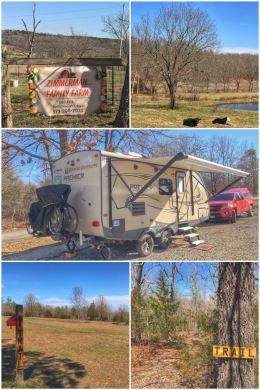 We started our adventure in Missouri in the little town of Mountain View in the central-southern part of the state, just over the state line, camping at a wonderful little place — Ozarks Mountain Springs RV Park & Cabins. We had the perfect spot in the campground and loved the hiking trails directly across from the campground (shown in the collage). While in Mountain View, we also used our favorite website, LocalHens.com, to find the wonderful folks of Zimmerman Family Farm, located just east of town in Birch Tree. Craig and his family raise grassfed and finished, pastured beef, and also have chickens and eggs and do it the right way — with no chemicals. We bought some fresh chicken and duck eggs and simply enjoyed supporting them. After purchasing our delicious eggs, we decided to make it a trifecta of fun by visiting a local springs and then a local winery. Blue Springs (not to be confused with Blue Spring, which is about an hour from Mountain View), is located between Birch Tree and Mountain View, and offers scenic views of a beautiful spring and surrounding rock wall. The color of the water is a brilliant green. We ended the day at Viandel Vineyard, a quaint little winery located between town and our campground. The relatively new owners have created a cozy tasting room, including table service with a small menu of sandwiches and salads. We enjoyed the tasting and left with two bottles: one of the Norton (partly because it is the official state grape and we needed to have at least one in our portfolio of wines), and one of the Alley (a blend of St. Vincent and Norton grapes). 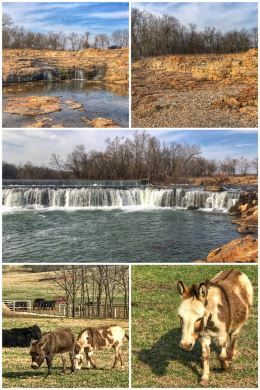 The next day we traveled to Rocky Falls, located in the Ozark National Scenic Riverways — about 34 miles northeast of Mountain View — and shown in the collage as well as the featured photo at the top of this post. 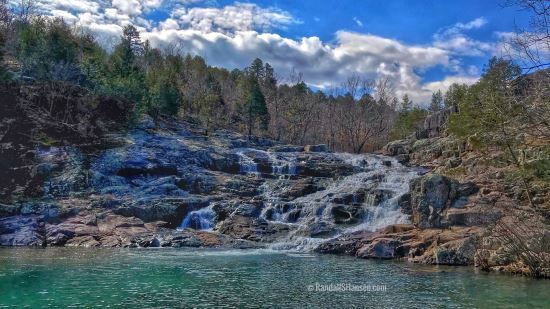 The proper name is really Rocky Falls Shut-In, in which a shut-in is a term for a type of rock formation found in the Ozarks where streams cut through rock and create falls, rapids, and plunge pools in small canyon-like area — shutting in the stream/river. In the case of Rocky Falls, instead of the water eroding the rock and creating a wider stream bed, the tough rhyolite porphyry (formed as molten rock deep within the Earth, flowing onto the surface about 1.5 billion years ago, and seen today as the reddish rock in the pictures) constricted the flow of Rocky Creek. 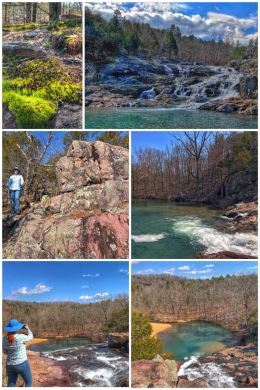 We hiked along the creek and up to the top of the falls for some wonderful views, but had also planned to cross the creek and take a much longer hike on the Ozark Trail… but the creek was running too high for us to feel comfortable enough about trying to cross it. 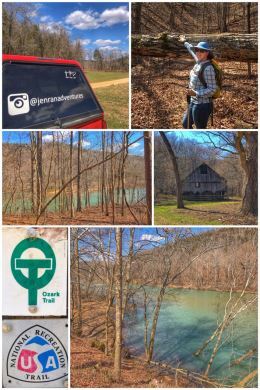 But Ran was determined to hike a portion of the trail, which is currently several hundred miles long and divided into 13 sections, but with plans to not only extend it to about 500 miles, but also connect it with the Ozark Highlands Trail (a portion of which we also hiked) in Arkansas. 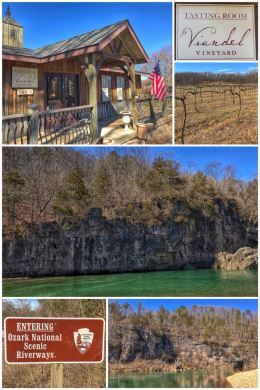 This National Recreation Trail travels from just outside St. Louis southwestward into the Ozarks and to the Arkansas line; it also includes an easterly loop around the St. Francois Mountains region. We ended up hiking several miles of the trail near the Owls Bend of the Current River in the Blair Creek section of the trail. (The trailhead is located off of Missouri Highway 106 on County Road 533, about 40 miles northeast of Mountain View.) The trail is fairly primitive, but well-marked (or blazed in trail lingo), and offers some nice views of the river as you hike deep into the forest. 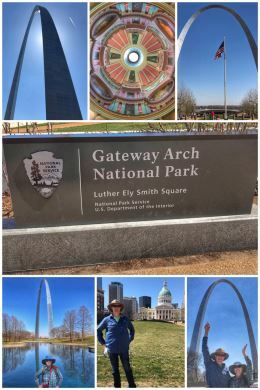 We traded country quiet to city craziness with our next leg up to the St. Louis area — to view and visit one of the newest national parks (#33 for us): Gateway Arch National Park, commemorating the westward expansion of the U.S. in the 1800’s. Known as the Jefferson National Expansion Memorial until 2018 when it became a national park, this beautiful 62-acre park is also located near the starting point of the Lewis & Clark Expedition (a recurring theme in our adventures in the west). Long before the iconic arch was built, the area was designated a national memorial in 1935 to commemorate three things: The Louisiana Purchase, the first civil government west of the Mississippi River, and the debate about slavery raised by the Dred Scott case. The park now includes the arch (built in the mid-1960’s), the Old Courthouse (where the Dred Scott case originated), and the Old Cathedral (still an active Catholic parish). We walked the park, which included curved paths and ponds — all designed to mirror and accentuate the curves of the arch. We also walked down to the Mississippi River and were again astounded by how close the water level was to the base of the retaining wall; we found out later from a park ranger that the river was 37′ above normal levels because of all the precipitation this year. While St. Louis has lots to offer visitors — including the 1,371-acre Forest Park, one of the nation’s great city parks, which once hosted the Louisiana Purchase Exposition of 1904 (known as the St. Louis World’s Fair) and the 1904 Summer Olympics and now includes the zoo, science center, and museums — we chose to mostly stay away from the city. 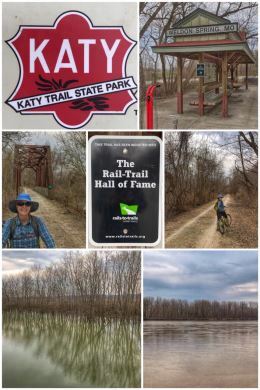 After hiking along the Mississippi River in St. Louis, we went to biking along the Missouri River, starting at the Busch Greenway in Lake St. Louis… which connects to one of the most well-known (and longest) rail-trails in the country: The Katy Trail. This 237-mile trail travels across most of Missouri, with end points in Clinton (west) and Machens (east) — along the old Missouri–Kansas–Texas (MKT) Railway line. The trail name comes from the nickname for the railroad, which came from its listing on the stock exchange using the initials KT…. or Katy. The trail includes 26 trailheads and and four fully restored railroad depots along the way. It is well-maintained and most certainly deserves its place in the the Rail-Trail Hall of Fame. The majority of the trail follows the route of the Missouri River, which results in having the river on one side and towering bluffs on the other. That said, the trail also travels through many types of landscapes including dense forests, wetlands and creeks, deep valleys, remnant prairies, open pastureland, and gently rolling farm fields — as well as old railroad towns — and includes numerous bridges and trestles, as well as a few other railroad remnants… and more connections to Lewis & Clark (and other historic events). We first hiked parts of the Route 66 State Park, just east of Eureka — which offers multiple looping trails. The 419-acre park is located along the Meramec River at the site of the former town of Times Beach, which was declared an environmental disaster and evacuated (in 1983) when it was discovered that a contractor who had been hired to spray dirt streets with motor oil (to keep dust down) has been doing so with dioxin added — which led to unexplained animal deaths and serious health conditions among the residents. In 1999, the EPA Superfund site was declared clean and the land converted to the state park. 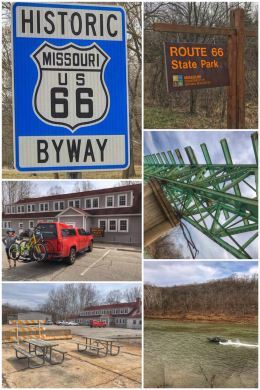 Besides stopping at the visitor center of the state park, we also visited the Route 66 Museum in Lebanon, just up the road (literally Route 66) from the cute little campground where we stayed, Happy Trails RV Park. The museum includes recreations of a 1950’s gas station (shown in the photo collage) and a classic diner, along with displays of antique cars, and a collection of Route 66 books, magazines, and videos. 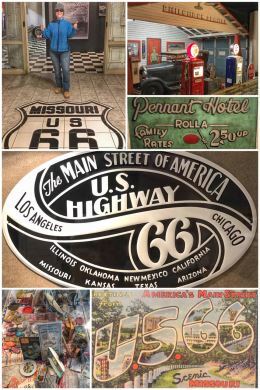 Can one ever get enough of Route 66 photos and memorabilia? By the way, we should mention that Happy Trails RV Park is a great little campground, literally a block off of the old Route 66… and our site was at the very end of the park, near a pond and a wonderful little nature walk. While in the area, we sought to restock our freezer with some grassfed — and grass finished — meat, as well as more fresh eggs. 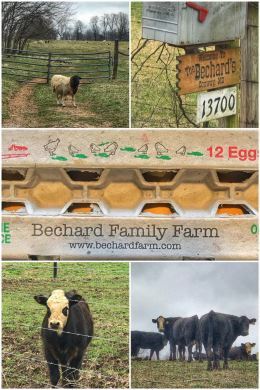 We happily stumbled upon the Bechard Family Farm, which sells beef, lamb, and chicken — all pasture-raised with non-GMO feed and free from antibiotics and artificial growth hormones. Armand and Teddi have been doing it right for decades — and their farm is definitely worth a visit. We loved chatting with Armand and sharing stories of proper grazing and feeding techniques and the sad state of meats and eggs found in most grocery stores. We even chatted about Joel Salatin, who our friend Carey talks about quite a bit, and who raises livestock using holistic management methods on his Virginia farm. 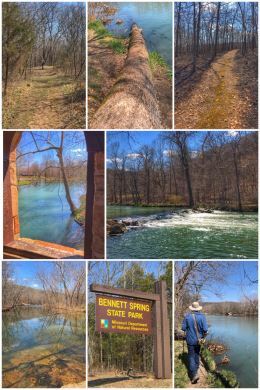 We ended our visit to this area of Missouri with a wonderful day at Bennett Spring State Park, located 12 miles west of Lebanon. Fly fishing is the main draw here, as one of a handful of state fish hatcheries is located here and the spring is stocked with trout. 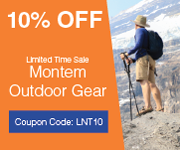 But one can also find camping, picnicking, canoeing, and hiking — as well as a great camp store — at the park. More than 100 million gallons of clear, cool water gush from Bennett Spring daily. We decided to hike two of the park’s 12 miles of trails. We considered the Natural Tunnel Trail, which is the park’s longest and which leads hikers to a natural tunnel carved by water, but instead hiked the 2.5-mile Savanna Ridge Trail and 1.5-Mile (RT) Spring Trail, which included us looping back to where we parked in the Spring Hollow Trailhead. We then headed to Joplin, our final stop in Missouri. 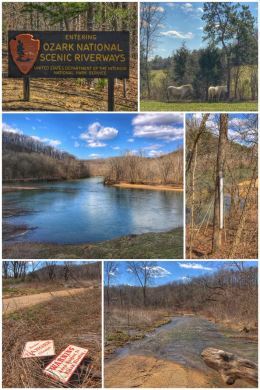 While there, we just had to hike the Wildcat Glades Walk, a 3.5-mile loop that takes you on both sides of Shoal Creek — including up on some amazing rock bluffs (with chert glades, a habitat that only exists in southern Missouri) on the west side, across an old bridge (Redings Mill) near a small falls, and up the east side along some amazing old caves and ledges. We started our hike at the Wildcat Glades Conservation Center (formerly Audubon Center) trailhead. 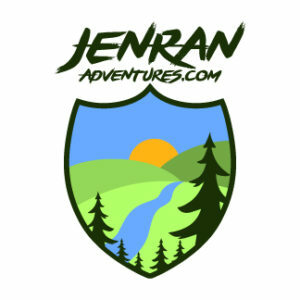 Located just south of I-44, it’s the perfect place to get information from the Missouri Department of Conservation (including a gift shop) and/or start your hike. We started our hike on the east side, heading north… which currently involves a detour as the trail is closed while they build a new bridge over the creek (replacing an ancient one-lane low-water bridge that often floods, restricting usage — which we used to cross the creek to continue our hike). 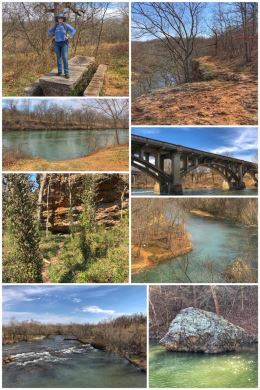 The hike was truly a fun experience — through a nice diversity of habitats, terrains, and even trails — as much of the trail is paved along the creek, but more natural along the bluffs and near the caves. 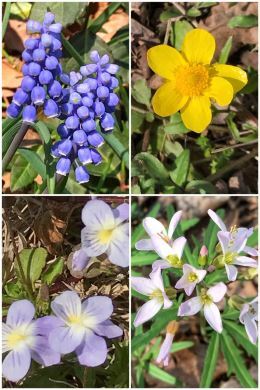 While we quite enjoyed all aspects of hiking the Wildcat Glades Walk, one of our favorite parts was seeing the slow emergence of Spring — with numerous wildflowers blooming and numerous shrubs and trees beginning to bud out. If you do not want to hike as much as we did, you can also park adjacent to the old Redings Mill Bridge (just south of the current Redings Mill Road bridge). The old bridge includes benches to sit and reflect on the beauty of the falls just below the bridge. From the bridge, you can hike either the east or west side trails. The east side trail — officially called the St. John’s Creek Trail — includes several informational signs. The west side — Bluffs Trail — climbs high up above the creek. 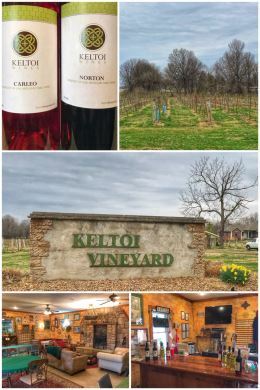 While in Joplin, we also had to explore some local wine — and happily found Keltoi Vineyard, located in Oronogo, about 18 miles north of Joplin, and founded in 1997. We enjoyed a nice visit with the winemaker, a young guy with a lot of ideas — and deep knowledge of wines. We enjoyed chatting about the Norton (the state grape of Missouri), as well as the Chambourcin, Marechal Foch (which we know from eastern Washington), and Catawba. We left with a bottle of their Norton, which is a very nice dry red, as well as a bottle of the Carleo, which comes from a Baco Noir grape and has a wonderful light flavor — which we enjoyed with our venison chili. We only got to taste at two wineries in Missouri — out of the 130+ operating in 11 different wine trails in the state. The state’s wine industry has a total economic impact about $3.2 billion dollars — and wine-tourists (who number almost 900,000) spend almost $250 million annually. About 1,700 acres are planted with grapes. White grapes grown in the state include Chardonel, Seyval Blanc, Traminette, Vidal Blanc, and Vignoles. By the way, we drove a big chunk of Interstate 44 while in Missouri — and if you can avoid it, do so. This stretch seems to be a major trucking corridor, and we watched some crazy tailgating and lane switching that made us quite happy to be motoring in the slow lane. Next, we make a short trip through Oklahoma on our way to five weeks exploring the grandeur of Colorado. Next Post:Stop 81: We’re OK with Oklahoma!